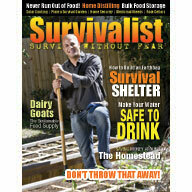 Be sure to check out my article “How to Build a Survival Shelter” at Survivalist.com that just came out in issue #3. Here’s an extract from the article. When I designed this survival shelter, I had four key concepts in mind: practicality, simplicity, safety and cost. Each concept is discussed in more detail below. Round structures enclose more space for a given amount of materials. There are no dead corners or wasted space. Round earthbag structures are the easiest shape to build. Poly tubes (the easiest and fastest method) or poly bags (lower cost if recycled and suitable for someone working alone) are easily shaped into curved or round shapes. Another main advantage is simplicity of construction. What could be simpler than filling and stacking bags of earth? Almost everything you need to know is freely available on the Internet. The main skills can be learned in a few minutes simply by being shown or watching a video. My Naturalhouse YouTube channel shows all steps of construction. And most people already have the basic tools around the house – shovels, buckets, garden hose, ladder. The other few tools required can be easily made or purchased inexpensively. For the complete article How to Build a Survival Shelter, order issue #3 at Survivalist.com. You can view all 120 home and shelter designs at Earthbag House Plans.